The Fourth of July will bring with it celebrations, barbeques, and fireworks. But horses and fireworks do not go well together, and panicked horses are at the risk for serious injury. If you suspect that there will be fireworks near your barn, you’ll want to take some measures to help keep your horse safe and calm. The first major decision you’ll face is whether to leave your horses in their stalls or turned out. Part of this decision is personal preference. Will you have fireworks going off very close to your property? Is your horse used to staying in a stall each night? Does your horse have adequate space in his pasture, and is the ground and footing good and safe? Before deciding to leave your horses turned out, consider your horses’ temperaments. If you have a horse that frequently challenges the pasture fencing and may be panicked by the fireworks, he could be seriously injured if he panics and runs through the fence. Buckley Steel Board Fence is designed to withstand lighter impacts but to give way upon significant impacts. This feature will provide more forgiveness and safety than other types of fencing, such as wood or pipe, will. With other types of fencing, a serious impact can result in devastating injury to your horse. If you leave your horses turned out, be sure that the fencing is strong and in good repair, and that all of the gates are securely latched. It is a wise idea to walk all of your fence lines to check the condition of the fence, especially if you suspect that your horses might be running around and get worked up by the fireworks. On the other hand, if you decide that your horses are better off inside the barn for the night, do what you can to minimize the noise of the fireworks. Consider leaving a radio playing softly during the night. Provide your horses with plenty of hay to keep them distracted – putting the hay in a small hole hay net can make it last longer. Putting equine earplugs into your horse’s ears can also help stifle the noise, but only do so if your horse is used to wearing earplugs. In extreme cases, your horse might warrant being sedated for the hours that fireworks are likely. 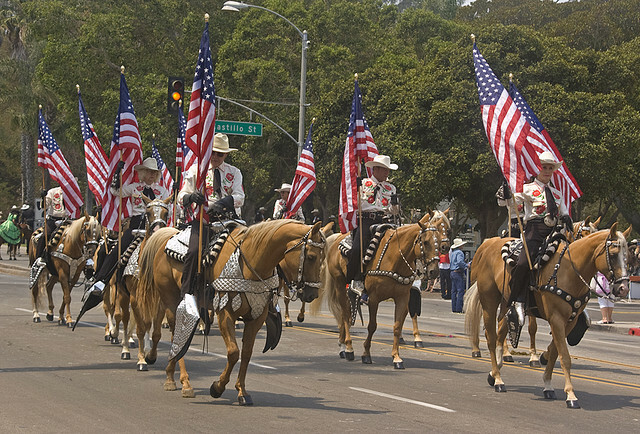 If you feel that your horse could seriously injure himself, then speak with your veterinarian about the best way to keep him safe during the Fourth of July.